Feijoa trees are readily available for sale from online and retail nurseries. The Feijoa Tree Feijoa sellowiana also known as the pineapple guava. Widely grown a fruit crop and a plant for the home orchard in NZ they are a hardy evergreen fruiting tree that are also used as hedging plants. This is a tree they will reach 5m in height (often smaller) however they are usually pruned to be smaller than this. All varieties are well suited to espalier if space is a problem. It is a frost tolerant fruit tree, try growing it in a position with protection from the hot afternoon sun for best results. Feijoa trees have very attractive flowers during summer, followed by edible fruit in autumn to winter. The fruit is said to have high levels of Vitamin C and can be eaten fresh, cooked or stewed, preserved or even turned into wine. As for taste, the fruit is said to taste as a mixture of strawberries, pineapple and passionfruit, and this will vary between varieties. The fruit is green and egg shaped, fleshy and juicy with a sweet flavour, varieties will fruit from mid summer (Gemini) to Autumn (Opal Star). The taste is sweet and perfumed, the fruit can be eaten fresh, simply split the fruit in half and scoop out the flesh. The fruit can also be used in muffins and goes well with ice-cream. 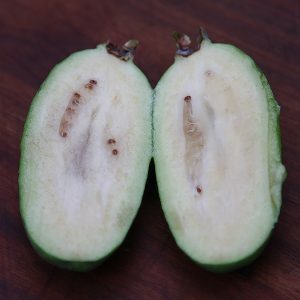 Feijoa trees require little care once established. They are best grown in a sunny position in a humus rich well drained soil. Once planted, mulch around the plant with stable straw, lucerne mulch or similar. An application of aged cow manure at this time will also be beneficial. Harvesting is best carried out when the fruit is ready to fall off the tree, this will give you the sweetest best tasting fruit. Remember to remove all fallen fruit from the ground to prevent disease and insects. Prune dead and diseased wood but resist heavy pruning if you are after fruit. Tree not setting fruit. Their are three reasons for this, the first is a lack of a pollinator, you will always get better fruit production with two trees, so convince a neighbour to plant one as well. The second reason is that the plant is in to much shade. Finally, heavy pruning will also set back flowering and fruit production. Mail order fruit tree nursery with over 200 temperate climate fruit trees. Heritage varieties and dwarf fruit trees. Apple Trees, Stone Fruit, Nut Trees and Berry Fruit.